A friend sent me a link to the Marx Foods website. I happily perused the available list of fine foods the company has to offer, but stopped in my tracks when I read that Marx was sponsoring their 5th Annual Morel Recipe Challenge. I’d never entered a recipe contest. Sounded like a fun way to get those creative wheels turning. And who cared if I didn’t win? Free morels! More if I did win. 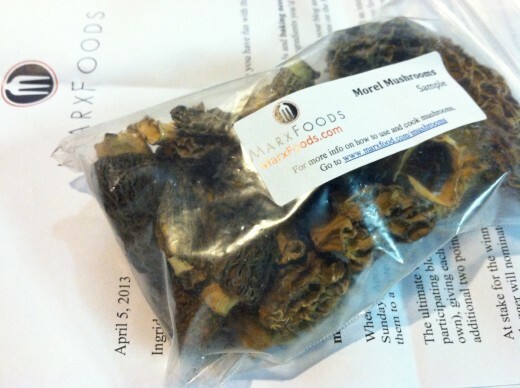 I toyed with a few ideas over the past couple of weeks since my contest sample of morels arrived in the mail. The rules of the contest required that the dish be baked. Popovers? No, I just did that with shrimp. Savory morel profiteroles? Sounded great, but the profiteroles would be baked, not the morel filling. 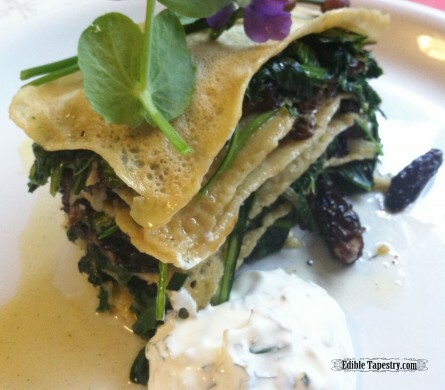 As I was harvesting the spring greens I was certain I wanted to use in the dish, I remembered a fellow blogger saying that his mother made lasagna using crepes. 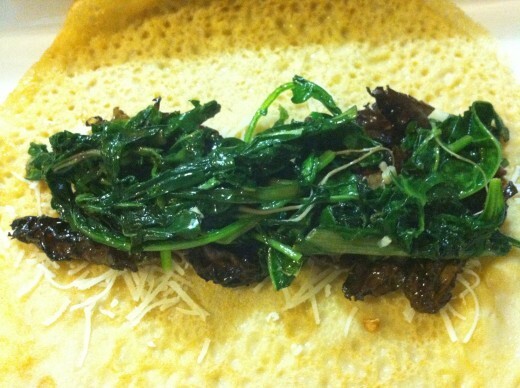 Lasagna sounded too heavy for morels, but what about a Napoleon? That spark of an idea was all I needed to hurry myself along and get my behind back in the house so I could push up my sleeves and commence flinging my gathered ingredients around, not that the pouring rain wasn’t a big enough motivation to get me moving. 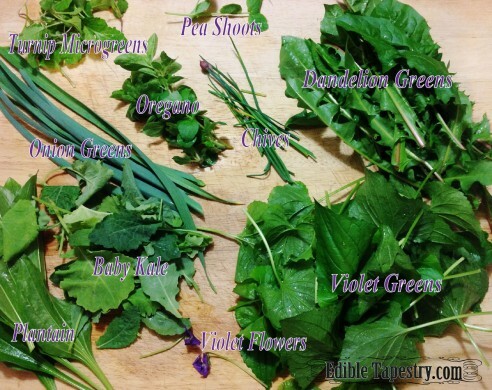 For the greens I used dandelion, broadleaf plantain, onion greens, turnip micro-greens, baby kale, and violet greens. 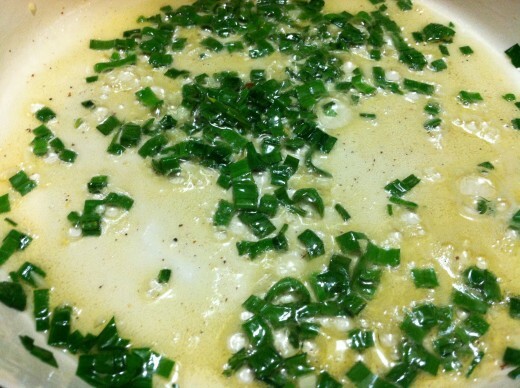 Add the melted butter to the beaten eggs, whisking well to combine. Beat in the flour and salt. Beat well to incorporate the flour. Heat a crepe pan over medium heat. 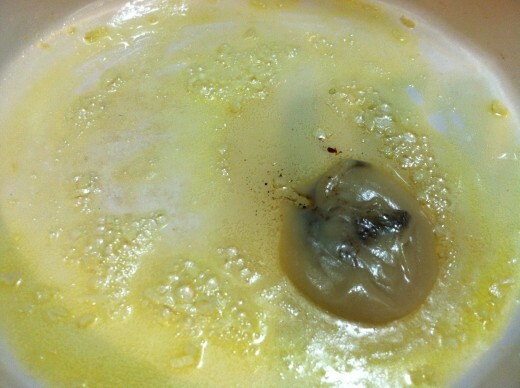 Melt a dollop of butter in pan. Pour just enough crespelle batter into the bottom of the pan to coat. Swirl with one hand as you pour with the other. 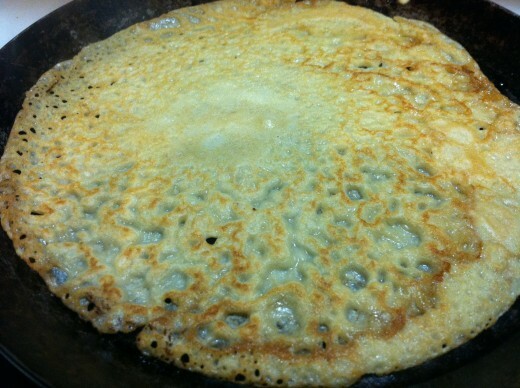 Cook for a couple of minutes, or until the crespelle is dry on the edges and releases from the pan. Flip and cook for around 30 seconds on the second side. Transfer to a dish. 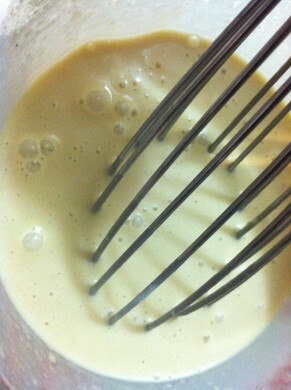 Repeat until all the batter is used. This recipe makes 12. To prepare the greens, heat oil, butter, and bacon drippings in the bottom of a large sautè pan over medium to high heat. 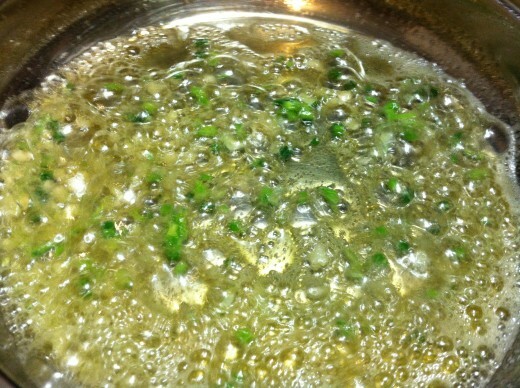 Add the garlic to the pan to sweat, then the onion greens. Let them cook a bit to release their flavor. Toss in the remaining greens. Prepare the mushrooms by placing a medium skillet over medium heat. 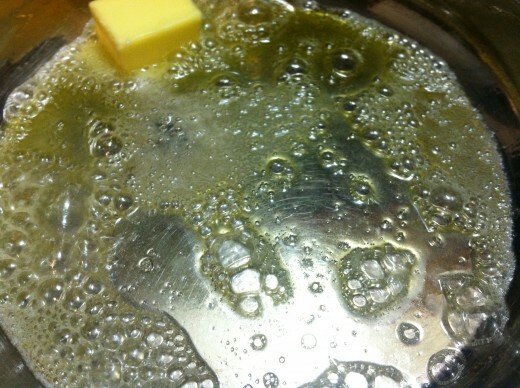 Add the butter and oil. Saute’ the garlic in the oil. Add the spring onion greens and cook a bit to release their flavor. 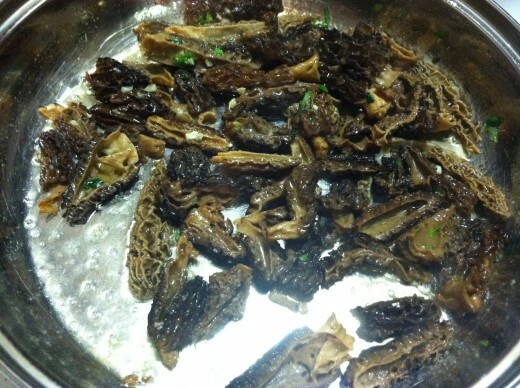 To the cooking aromatics, add the morels, salt, and pepper. Saute’ for 5 to 8 minutes, reducing the heat to prevent scorching. 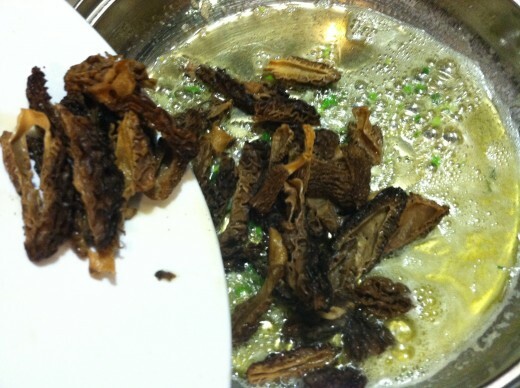 Cook thoroughly, as raw morels contain a certain level of toxicity. Lay a crespelle in the bottom of a baking dish. Sprinkle with a little grated parmesan. Spoon on a bit of morels. 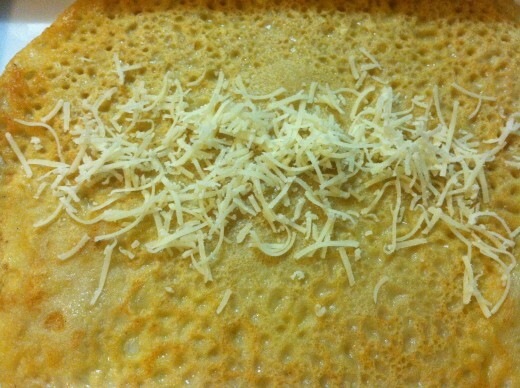 Add another layer of crespelle. Repeat until all the ingredients are used. Cover and bake 30 minutes. Serve with a dollop of herbed cream. I made a very tall, six layer Napoleon using a single crepe per layer to maximize the ingredients I had available. 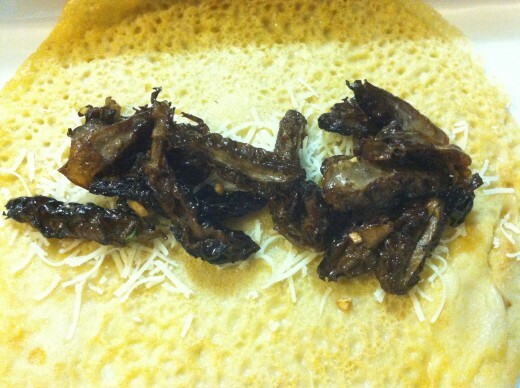 The recipe instructions, utilizing all the crespelle, will make a shorter version and more portions. Note: Any greens can be used in this recipe. It’s not a good idea to forage for wild edibles unless you’ve been educated on the subject by an expert who can properly identify edible foods in nature. 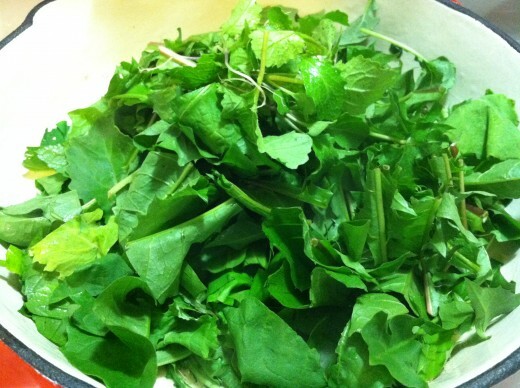 The information on nutrition and wild edibles in this post is not intended as advice for others. 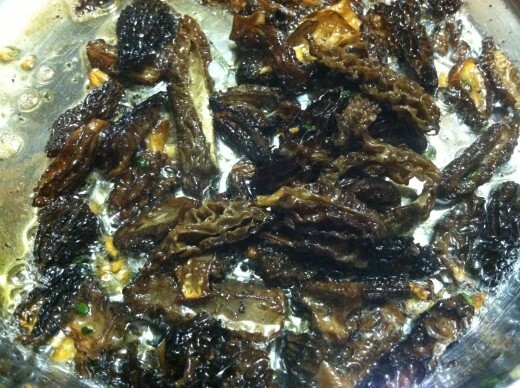 Remember that morel mushrooms must be thoroughly cooked. 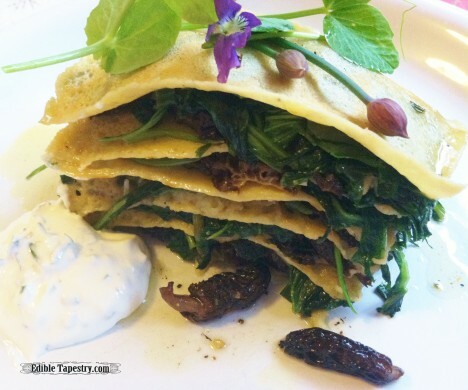 I love the idea of using the “morel juice” in the batter. Thanks! Love your photos and graphics. I also liked your “About Me” page. Very interesting. Good luck in the contest and thanks for stopping by Ed. Tap. I wanted to say that your recipe looks amazing and it’s an honor to compete with you in this cooking challenge! Best of luck to you! Thanks! Looks like you’re in the lead. Incidentally, I’m posting my recipe for salmon en papillote this week. Good luck in the contest. 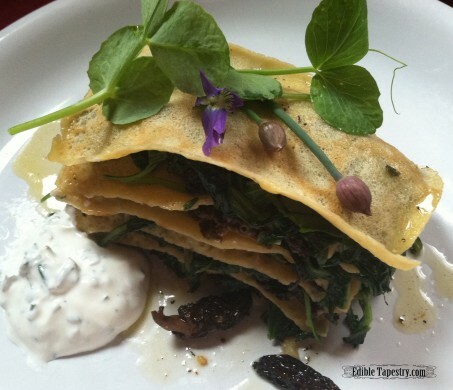 This looks so pretty and I love all the foraged greens! I’m glad to be a part of this challenge with so many other talented bloggers! Thank you so much. 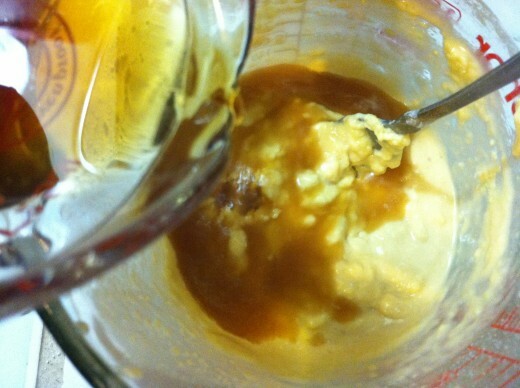 I really liked your custard recipe. Good luck!